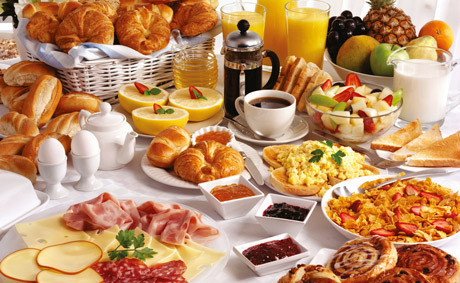 Researchers have found that eating a big breakfast of 700 calories promotes weight loss and reduces risks for diabetes, heart disease and high cholesterol. The study comes from Tel Aviv University, where Prof. Daniela Jakubowicz and colleagues studied the impact of different caloric intake at varying times of day. What they found is that the time of day we eat has a significant impact on how our bodies process food. “Big dinner group” – consumed 200 calories at breakfast, 500 at lunch and 700 at dinner. The women’s diets consisted of moderate fats and carbohydrates, totaling 1,400 calories, and they followed the diets for 12 weeks. The 700-calorie meals, whether eaten for breakfast or dinner, contained the exact same foods, and included a dessert item such as a piece of chocolate cake or a cookie. The women in the big breakfast group lost, on average, 17.8 pounds and 3 inches from their waist. The women in the big dinner group, on the other hand, only lost 7.3 pounds and 1.4 inches from their waist. Additionally, the women from the big breakfast group had larger decreases in insulin, glucose and triglyceride levels than the women from the big dinner group. The researchers note that one of the most important findings is that the women from the big breakfast group did not experience high blood glucose level spikes that normally occur after a meal. Although the big dinner group was eating a sensible diet and losing weight, the researchers actually found that their triglycerides—a type of fat found in the body—increased, putting them at a higher risk of heart disease, diabetes, hypertension and high cholesterol. Breakfast Sandwich: Top a whole wheat English muffin or whole wheat pita with 1 ounce lean ham and a flavored mustard. Pair it with fresh fruit and a small wedge of low fat cheese. Victoria Taylor from the British Heart Foundation notes that the study from the University of Tel Aviv stresses how important the timing of our meals is for our health. 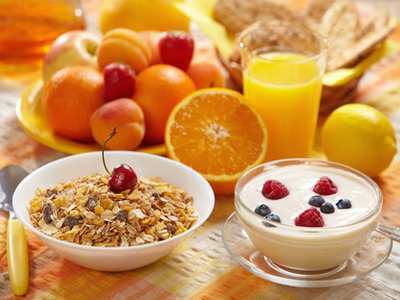 Though she does say that this is a small, short-term study and therefore further research is needed to check long-term results and effects for men, she suggests eating in the morning to promote weight loss. She adds, “Wholegrain toast or breakfast cereals with low-fat milk will make that mid-morning snack less tempting. If you’re going for a cooked breakfast, try poached eggs instead of fried and make sure you grill any bacon or sausages.” A 2012 study shows that eating egg proteins for breakfast may help you feel fuller for longer. and a pauper for supper.